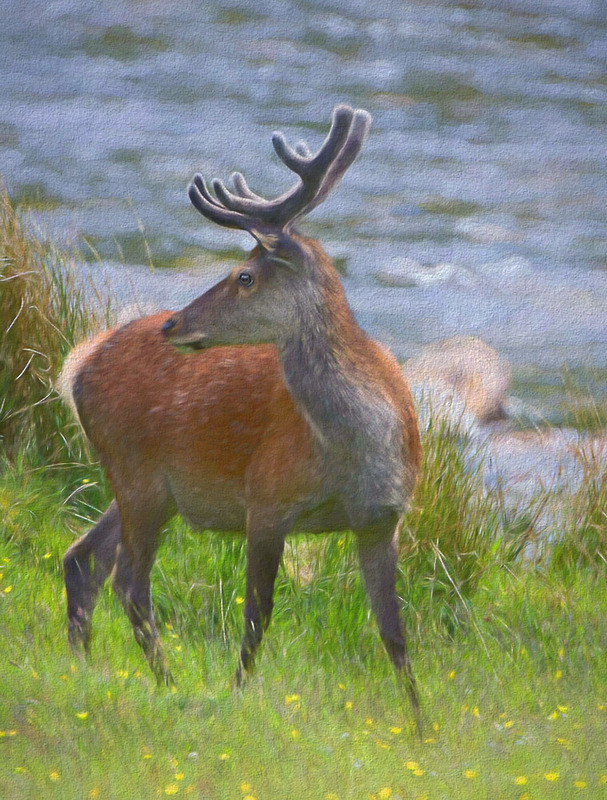 A Red Deer stag in velvet, beside the river Etive in the Scottish Highlands. Please click for full size view. Painted with Topaz and Photoshop. I'm very impressed with the degree of detail you were able to maintain and still present an image which is obviously a painting. The stag is quite handsome, and the yellow wildflowers at his feet are a wonderful accent to the image. Love the color palette and the great tones in the grass, the water, and the stag. A beautifully painted and well-presented piece, Carol. Oh, so soft, Carol- love the painterly effect-"velvet" is the word, not just for the antlers. Delicious colors with the pretty yellow flowers and lovely blues in the river. Love the look-back pose too. A real wall-hanger! Sweet textures and soft color palette.